Track sales activities using our customisable template for accounts, contacts, leads, and opportunities. Manage the complete end-to-end process within SharePoint by utilising our CRM SharePortals extension modules, or talk with us about integration in to 3rd party systems. Modern Customisable CRM: Using a CRM with no web interface, limited features, or just doesn’t quite fit how your business works? Each entity within our CRM has been structured for typical needs, but can be changed as little or as much as needed by a power user. Dashboards: Powerful dashboards which can be enhanced using Power BI to create stunning visuals. By utilising our extension modules or a supported data source for related systems, end-to-end dashboards can be created from lead to invoice payment. 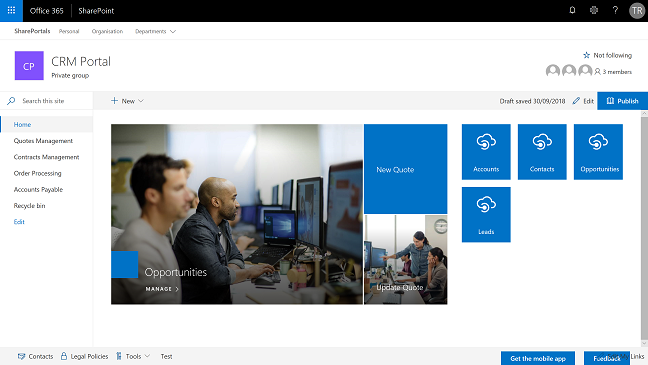 Easy Digital Capture: Use our email capture tool to tag specific emails or other Office 365 services like PowerApps to capture or retrieve data on the move.